What materials make a good back splash? 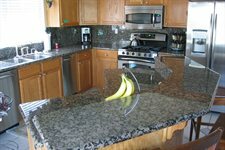 Anything from tumbled marble, travertine, and mosaics to glass tile and many many more. Just keep with your color design scheme and watch what material you choose because some materials cost more than others.